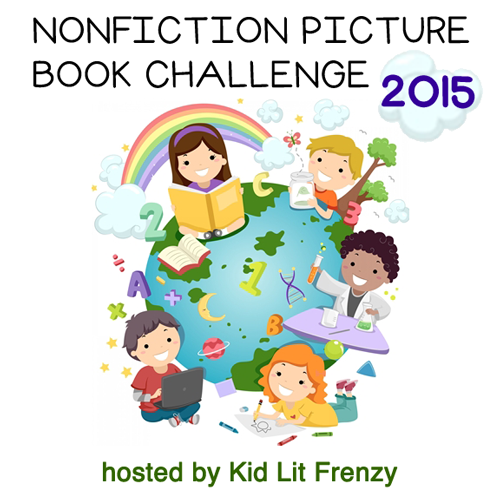 I'm glad to be back to share this Wednesday to Alyson Beecher's Non-Fiction Picture Book Challenge at her blog, Kidlit Frenzy. Because of this meme, I discover many great titles to find and read. I can't buy them all, and am lucky to have a good library that nearly always has the books I request. Here are a few books with stories and illustrations that just might become favorites of yours. Some of us check in periodically with Carrie Gelson of There's A Book for That to share what we've read from our "must read" lists. We started these lists because in the excitement of newly published books, other books get left behind and don't get read. These books are worth a read, but keep being pushed aside. Sorry to say that in this past period I've only managed to read one of the books on my list, but it was a terrific one: The Great Trouble: A Mystery of London, the Blue Death, and a Boy Called Eel (click for my review) by Deborah Hopkinson. And, I'm reading another, Blue Lily, Lily Blue by Maggie Stiefvater. I hope to do a lot of catching up this summer! It's a gorgeous book filled with information written so accessibly for young children. There are comparisons often, like a whale's heart weighs as much as a small car, or an average blue whale weighs as much as 55 hippopotami, and on the page, there is a wonderful, colorful pile of them. The illustrations help make the challenge of rather hard information to take in, but for those younger children interested, I think they will look and read, or have this read to them, again and again. 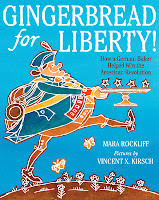 I loved the next two books, both smallish stories from the American Revolution. They have additional back matter too, and both are written by Mara Rockliff! I am so glad to know about this man, Christopher Ludwig, truly a good and generous man who did things dangerous even at a later age, even unfit. 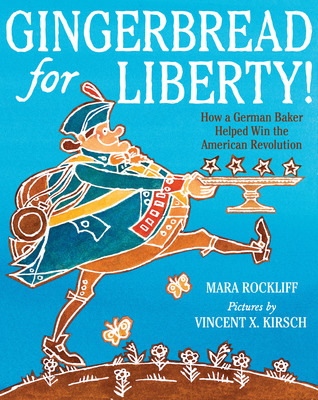 He was known for making wonderful gingerbread, but went off to join General Washington anyway, helped with cooking so much that he persuaded German POWs to join our side, and gave away extras all his life to those who didn't have enough to eat. There is still a foundation formed by him in his will that gives money to needy children in Philadelphia for their education. The clever illustrations are all in gingerbread form, every one! There is so much to learn in this book, and then much to search for again. 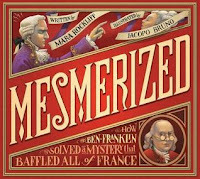 The story covers the story of a Dr. Mesmer and his ideas of a mystery cure to patients so alluring that doctors began to complain to the king that he was taking away their business. This king would be Louis XVI, and even his wife, Marie Antoinette was "mesmerized". Ben Franklin was grateful for the help sent by the king to fight in the American Revolution, and when asked to investigate this doctor's new 'cure', he was glad to do it. That outcome, and the extraordinary discoveries by Ben Franklin and others at the time are also included in the book. The illustrations are bold and filled with action, in large pages with smaller 'windows' of information, sometimes with bold headlines and smaller drawings illustrating that topic or simply double-page spreads beautifully shown. I can imagine students picking more than one topic to research further after reading this marvelous book. 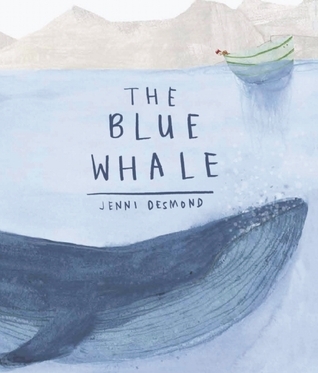 I haven't read The Blue Whale yet, but it looks like a beautiful book. I need to see it! Thanks, Teresa, it is gorgeous! I read The Blue Whale just recently, and I'm completely in love with it! Yes, it is truly a wonderful book, just like those blue whales! I don't know ANY of these! And I want to know ALL of them! Off to the library today! They're all from the library, Carol, returning them today too! I need to read The Blue Whale next time it gets into the store. It's fun when we end up reading the same books because of one another's recommendations. I think we all read many of the same ones, Earl. But there are some I don't get to, so then I discover them again! Enjoy The Blue Whale! I'm waiting for The Blue Whale to come in for me from the library, it looks like a good one! 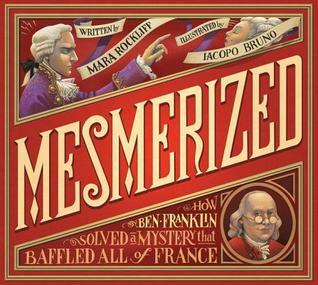 I really liked Mesmerized, I just loved seeing the scientific method used throughout the book. Yes both are terrific, & the scientific method was so well explained & illustrated, too! I'm on the reserve list for The Blue Whale, but it is still on order. I'm number 2 in line. I won't be surprised if Carrie Gelson is number 1! Maybe not. I think she owns it! Enjoy, Cheriee!